2014 saw many changes made to the Primary National Curriculum. Although the content has essentially been slimmed down, there is no denying that the new content is certainly more challenging. One change to really catch the attention of teachers and parents, was the shift from ICT to Computing, and in particular, the word ‘Coding’ and the various vocabulary that comes along with it, such as programming, algorithms, debugging and so forth. The computing curriculum was initially an alien language to many primary teachers. 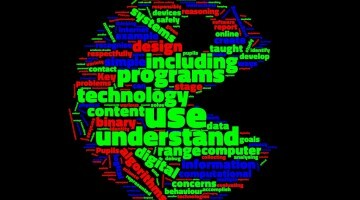 Even ICT Leaders in schools scratched their heads, before embarking upon a frantic search for Coding CPD. 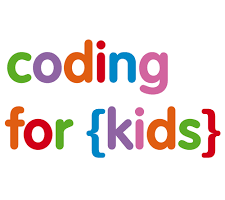 Within my own school, and in many I know of, the requirement to teach ‘coding’ has actually become a really exciting area of learning, made easier through the use of the programming software, ‘Scratch’. Scratch software is free for desktops and easy to download from their website https://scratch.mit.edu/ . A slightly simpler version called Scratch Junior is also available as an app to purchase for tablets. 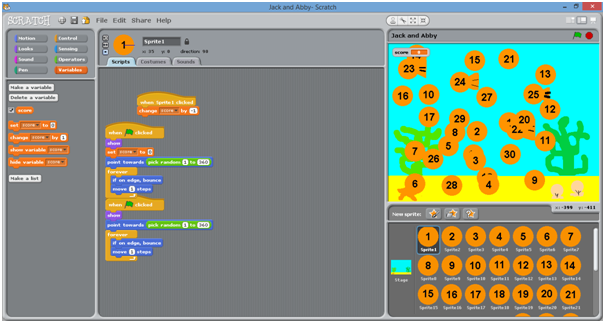 The use of Scratch software works as an ideal introduction to programming as it allows students to program by physically joining blocks of code, rather than writing it out. Objects, called Sprites, can be added (people, animals, vehicles) and the programmer’s script can make these sprites move and speak. 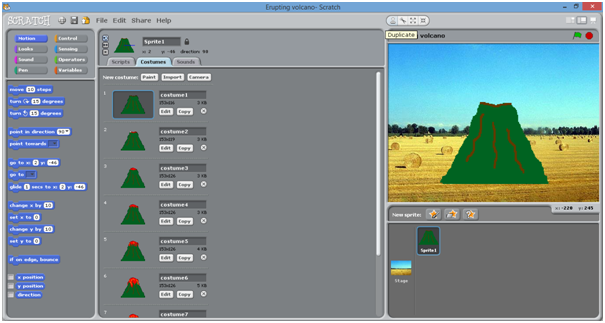 Scratch has brought some real value to my teaching of computing. There is so much opportunity for creativity through cross-curricular links, and using the software has been a great starting point for pupils who have never come across coding before. Volcano Animations: As part of our topic on Natural Disasters, the children created code to show an erupting volcano. Children chose a background from the library, designed their sprite, and simply by changing the costume very slightly every 0.2 seconds, the animation works a bit like a cartoon flip book. When planning to create our own games on Scratch, we first made use of Phil Bagge’s excellent resources at code-it.co.uk. The site is jam packed with Scratch activities for children of all abilities. One such resource was the Times Table game. Pupils worked in pairs to create their own version of this game that would allow other children to practise their multiplication recall. This involved children not only designing their background and moving sprites, but creating a score board and time limit. This term, pupils are working on creating a Year 6 revision game, with various designed sprites asking questions that must be answered through multiple choice. In another year group, I have seen pupils writing code to make a sprite draw various 2D and 3D shapes, thinking about internal and external angles. The opportunities for creativity within Scratch appear quite limitless and I have been amazed at the number of children completing their own Scratch projects at home to share on the class blog or within the online Scratch Community. The element of ‘debugging’ has now become a favourite of mine as it encourages problem solving, discussion and resilience, for both the children and the teacher! As children at a younger age become more familiar with software like Scratch, programming in the classroom is sure to become more and more interesting!